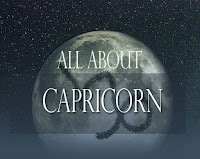 CAPRICORN - All About Capricorns | Capricorn Life - Capricorns Rock! Capricorns are ambitious, and the lives of those born under this sign are marked by a purposeful pursuit of their destiny. Capricorn's motivating force is desire for success, money, status, position, authority, and (though Capricorns may not realize it) for love. Capricorn is both an earth sign and a cardinal sign, and the combination of practicality (earth) and initiative (cardinal) produces a personality geared toward leadership and power. In the zodiac Capricorn is linked to the Midheaven - the point at the top of the horoscope that represents high achievement. Capricorn is a born climber who’s not content to poke along down in the valleys. As long as there is a top to get to from the bottom, Capricorn will persevere in their upward striving. Capricorn symbol is the Goat, and everyone knows how goats bound up impassable terrain, finding footholds where no one thought they existed. Capricorn always carry with them the knowledge that there are tasks to be fulfilled and if they can’t move mountains, then at least, like the Goat, they can scale the heights. Capricorn's ruler Saturn is the planet of limitations, which includes the limitation of time. (To the ancients, Saturn was the symbol for Father Time.) Capricorns have a heightened sense of the value of time, which helps to make you a superb organizer and planner. Unlike those who don’t look beyond next month, Capricorn will carefully examine their goal, separate it into all its necessary steps, and plot out a long-term timetable that often involves years. In the sign of Capricorn, the quality of patience reaches new heights. One of the hallmarks of the Capricorn zodiac sign is that they learn to wait for things they want. Capricorns are willing to give up today’s temptation for tomorrow’s reward. An aura of melancholy and sternness often surrounds Capricorns. Saturn has been called the Celestial Taskmaster, for it symbolizes responsibility, discipline, and restriction. As a child of Saturn, Capricorns need something to improve and to perfect. Capricorns could have been the prototype for Lewis Carroll’s sly and charming jingle about industriousness: “How doth the little crocodile improve its shining tail…?” Capricorns are ambitious, practical, and, above all, determined. Capricorns are not interested in vague theory; they want to put any knowledge to use. Their active mind quickly grasps ideas, and they have an admirable ability to concentrate. Capricorns are precise and orderly, and generally don’t trust others to look after details. When Capricorns give their word, they stick to it, and when they undertake a task, they complete it to the best of their ability. Capricorns tend to fuss over details and make sure all contingencies are covered. It’s their way of being in control. Because of Capricorn's diligence, people sometimes fail to give them credit for their creativity. Yet Capricorns are highly creative - their skill is to link this to their talent for organization. Capricorns put dreams into action, and are especially drawn to the artistic arena and the performing arts. Capricorns think of themselves as a real person in a real world that allows little time for idle pleasure-seeking. In certain ways, Saturn is an austere and strict parent that lives inside each Capricorn. Essentially, they feel they can depend only on themselves. The child in Capricorns feels unworthy—and their lifelong lesson is to shed this feeling and learn to love themselves. Capricorns do not need to be their own parent who disciplines and keeps them toeing the line. Capricorns must allow the spontaneous part of themselves to play and run. Capricorn's remoteness of spirit is often misunderstood by others; it has been described as cold passion. But they are not cold as much as self-sufficient. Because Capricorns need to organize and control their surroundings, on occasion they take a strong hand in other people’s lives. To them, it’s not meddling but handling things better. Beneath Capricorn's reserve, there is a sensitive and sympathetic person, and anyone who needs a strong shoulder to lean on need not look further than Capricorn. Certainly Capricorns do not deserve their reputation for being sober and gloomy. One of their more striking characteristics is a sense of humor. Capricorn's wit may be dry, incisive, but it is extremely funny and has a way of erupting when others least expect it. As is Capricorn's nature with everything else in life, they are cautious and conservative with money. Chances are they will amass wealth during your lifetime (usually in the later years), for they know how to make sound investments. In business, Capricorn's success is due to painstaking preparation. The journey of ten thousand miles may begin with a single step, but Capricorns know they can’t get anywhere unless they first know where they’re going. Capricorns may not size up a situation as quickly as some, but this can be an advantage, for it means they won’t heedlessly plunge in. Instead, they will research, examine what others have done before, and gather all relevant data. Only then, with a thorough understanding of the details, will Capricorns begin to move. And then they won’t be stopped until they reach their goal. to them. They are the loner of the zodiac, but have a great need to be loved and appreciated. Unfortunately, they won’t let this need be known—in fact, Capricorns are a past master at concealing it. Underneath the mask, they still wear other masks, and it can take a long time for others to discover the real them. To others Capricorn may appear aloof, indifferent, hard to reach because they are so self-contained. But the very elusiveness of Capricorn personality can be hypnotically attractive. Like a riddle wrapped inside a sphinx, there seems to be a fascinating secret buried in their depths. Anyone who cares enough to penetrate Capricorn's shell of reserve will be greatly rewarded. Capricorn's affections and loyalty run deep, and they cherish and protect those they love.